In this issue, Batman tries to keep a secret from the rest of the Justice League, in an elaborate plot to (spoilers) solve a mystery that traces its origins to the beginning of the multiverse! 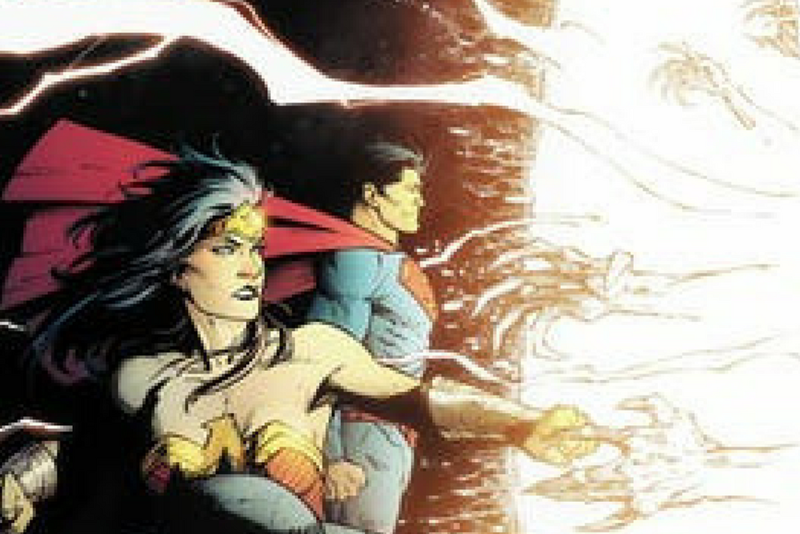 Superman and Wonder Woman are a step behind the winged-Wayne catching him at the climax of the book. However, before they can intervene the Court of Owls intercedes telling Batman about their involvement in events going back to his first days as Batman. Batman is mired in a mystery involving an ancient explorer, Krona, and a series of metals that have made him into a doorway to a dark world! The story begins with a narrative “from the journal of Carter Hall.” A story about an ancient scientist, Krona, who was searching out the origins of the Multiverse. Krona was searching out the mysteries of creation. He developed a machine, which he uses to peer into the very core of the universe to see what was “behind it all.” Krona saw a great hand and the very act of looking opened up millions of worlds. The origin story of the multiverse is about exploration and finding “the one thing.” The story ends with a cautionary statement by Barbatos that exploring too far can result in irreversible damage to self and the multiverse. A collective group of heroes is hunting Batman. He stole the most dangerous weapon in the universe: Darkseid (as a baby). According to Kendra, Batman’s actions have set off alarms all over the world. The Justice League is in hot pursuit but is a step behind. Batman succeeds in finding a way to face Barbatos; however, he’s been tricked by the Court of Owls and is somewhere much different. Batman’s failure leads to his transformation and the opening of a doorway to a dark world. However, the Dream, Sandman, offers a word of hope prior to his deception which leaves us with the hope that these dark forces can still be defeated. For as densely packed with dialog, the action was on point and keeps the reader interested. For example, in one portion of the book, the Justice League is pursuing Batman through the Amazon rain forest. Damian is driving the Bat-Hog with his father, Batman, hidden in the back. This sequence includes some of the best Damian lines ever written! As Damian drives away he states, “basic strategy, separate, distract, regroup.” The dialogue between Flash and Batman during this portion of the chase is equally engaging. Flash tells Batman that he can move faster than the average human can think. Batman asks, “How heavy is the average head?” And, promptly face plants Flash in the swamp. The art was beautiful; it captured the expansive nature of this story with so many characters while supporting the emotional moments each step of the way. Panels of note include the Swamp thing rising from the watery depths with four members of the Justice League trapped in his vines. Another amazing scene involved “Finnisterre”, the Antarctic lava pits, a panel captures a secret base with its metal appearing like a polished piece of fine silver. Finally, Batman is depicted as a shadowy figure, in an intimate conversation with Sandman, that captures the emotion of the moment beautifully through its use of colors and tones. There is a lot in this story that involves the Court of Owls and Snyder’s run in here, yet it doesn’t require the reader to have already read those stories. However, upon completion, the reader will want to revisit Snyder’s run if they have not previously. The mystery around the Court of Owls involvement in Batman’s exposure to the metals that set him up to be trapped by Barbatos was intriguing and very compelling. Finally, the inclusion of Sandman is limited but impactful. His brief statement to Batman at the end of the issue promotes hope and opens a whole set of possibilities for this character moving forward with this story. There were several callbacks to great stories in continuity that will certainly escape most readers on the initial read. Some examples include The Return of Bruce Wayne, the final issue of Endgame, where Bats fought Joker. During the Court of Owls, he drank the Eloctrum when he was going nuts in the Court’s labyrinth. Finally, during the finale of Darkseid War Darkseid was turned into a baby. There are, perhaps, many more callbacks which were missed. The lone misstep, for some readers, came when we learned that the missing metal was named “Batmanium”. The name will come across as lazy writing for some. However, this was overshadowed by numerous wonderful sequences, including, a chase scene in the Amazon involving the Justice League. The pursuit, which involved Batman utilizing several decoys of himself, was a nice way to involve different members of the DC universe. It doesn’t appear that this portion of the story had a substantive impact on the larger story. However, this portion of the story involved some snappy dialogue between Damian and Batman, and the appearance of the Swamp Thing! The artwork depicting Swamp thing was amazing! Finally, Superman’s dialogue throughout this pursuit is wonderful. Readers will be on the edge of their seat throughout! The issue requires minimally two or three reads to catch everything that’s going on. This story is shaping up to be a modern-day classic. For as densely packed with dialog, the action was on point and keeps the reader interested. For example, in one portion of the book, the Justice League is pursuing Batman through the Amazon rain forest.